“Fine weather and on-time.” Jerry Larson of UP Aerospace described the most recent Spaceport America launch as a success all the way around. 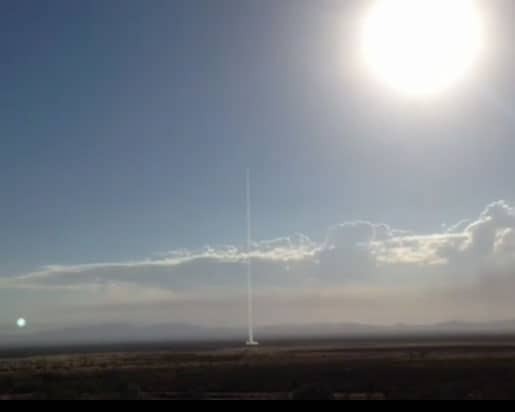 UP Aerospace, out of Denver, launched its SpaceLoft-7 rocket at 7:57am on June 21. It carried several payloads, including at least 7 new technologies to be tested in zero gravity (results coming in about 4 months). It was the first launch of student experiments sponsored by NASA’s Flight Opportunities Program. Also on board: the ashes of former mayor of Hatch / Spaceport proponent Judd Nordyke, who died earlier this year. Payloads were retrieved intact about 25 miles west of Spaceport America, at White Sands Missile Range. UP Aerospace is under contract to provide commercial launch services to NASA. Their next launch, of SpaceLoft-8 (also for NASA) is scheduled for Oct. 9, 2013.